When we first spent 3 days in Budapest in 2015, we immediately knew that we would be back: Budapest grabbed us hard, and we quickly fell for the city’s beautiful architecture, amazing river views, and unique repertoire of things to do (the lower-than-usual prices for exploring an epic European capital city helped, too!). Since then, we’ve returned to Budapest for several weeks worth of travel, getting to know the city a bit deeper on each visit–and each time we say goodbye, we find that we’ve fallen in love with it even more. Heading to Budapest for the first time? 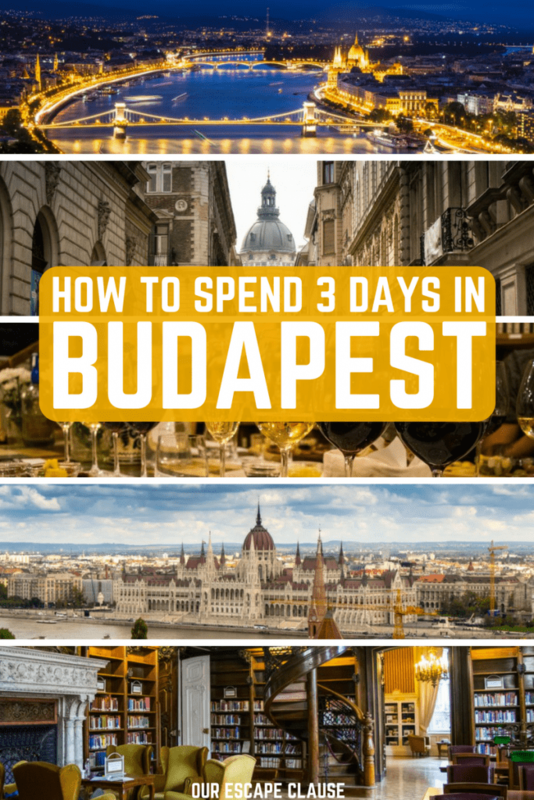 This 3 days in Budapest itinerary is designed to make the most of your first trip! Visit the epic Hungarian Parliament. Nestled right up against the Danube, Hungary’s incredible Parliament building is known as one of the most beautiful in the world for good reason! If you’d like to take a tour inside the building, you’ll need to book a tour at least a few days in advance (and possibly more if you travel during the summer). If you’d rather not fork over the forint, admiring the building up close from the outside is definitely still worth stopping by. We made a point to walk by several times during both of our trips to Budapest! Shop affordable Hungarian Parliament tours today! Stop by the Shoes on the Danube monument. If you leave the Parliament Building and walk along the edge of the Danube River toward the Chain Bridge, you’ll soon notice dozens of bronze shoes on the ground, facing the water. These represent a memorial to people (many of them Jews) who were murdered along the banks of the Danube in Budapest between 1944-1945. Before being shot and having their bodies fall into the Danube to be swept away, victims were forced to remove their (valuable) shoes, so as not to waste them. Stroll across the Chain Bridge. After reflecting at the Shoes on the Danube memorial, it’s just a short walk to the Chain Bridge. Complete with its iconic lion statues, the Chain Bridge is one of Budapest’s most famous landmarks, and no visit to Budapest could be considered complete without walking across it. The views of the river and the Parliament are beautiful–be sure to stop for plenty of pictures! Enjoy the views from Fisherman’s Bastion. 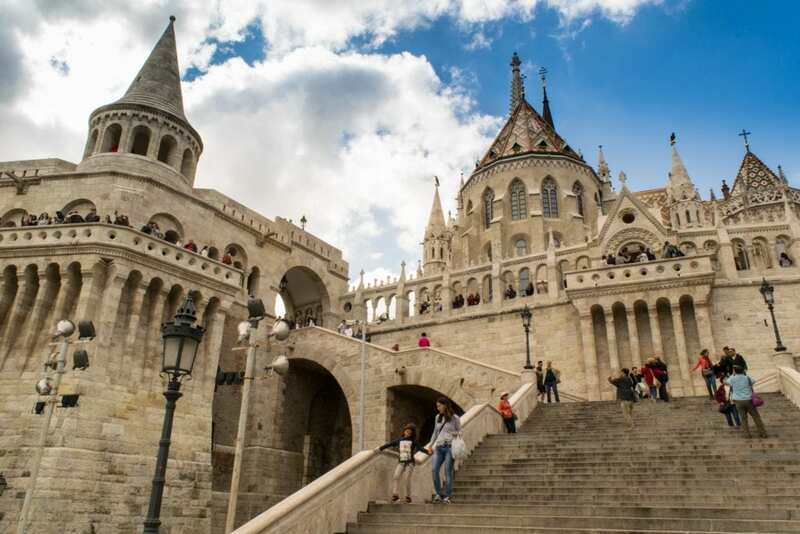 Justifiably Instagram-famous, beautiful Fisherman’s Bastion is home to some of the best views in Budapest (though not the very best in our totally biased opinion). We love climbing all over the towers and through all of the viewpoints–in many ways, Fisherman’s Bastion is a bit of a grown-up’s castle jungle gym! If you’re hoping to snap photos… well, you’ll be sharing the view with a few hundred friends. If dreamy Fisherman’s Bastion photos with no crowd are on your Budapest wish list, consider shuffling this Budapest itinerary around and arriving around dawn. To get to Fisherman’s Bastion from the base of the Chain Bridge, you can either catch a local bus, ride the funicular up Castle Hill, or make your way up via a long and steep walk! Directly behind Fisherman’s Bastion sits the colorful and striking Matthias Church: with its brightly colored tiled roof, detailed painted interior, and architectural splendor, it’s no surprise to learn that this building has quite the history. Dating back to the 13th century (with significant changes and rebuilds at several points dating into the 19th), Matthias Church has, among other highlights, played host to royal weddings, the coronations of two Hapsburg Kings, and spent 150 years as a mosque. Buda Castle is an iconic landmark in the city–whether you want to visit just for some of the beautiful views from the grounds and to enjoy the exterior of the building or you feel like ducking inside to the Hungarian National Gallery or Budapest History Museum, Buda Castle is a must-see item on any Budapest itinerary. We visited the National Gallery during our first trip to Budapest and greatly enjoyed it–perhaps on our third trip we’ll make it to the Budapest History Museum! Take a cruise on the Danube River. … And for best results, take one at sunset. On our first trip to Budapest, we watched the sun go down and the city lights come on from the water, and it was one of those magical travel moments that ended up sticking with us. Whether you opt for a more affordable group cruise or a more intimate and pricey dinner cruise, it’s definitely worth the splurge to hit the water while in Budapest. This Danube River cruise is well-reviewed and features live music! Begin at Central Market Hall. No 3 days in Budapest itinerary would be complete without a stop at Central Market Hall–honestly, this is one of our favorite spots in Budapest! We love markets of all kinds, and this one is particularly large and beautiful. The ground floor is made up of groceries and is a great place to pick up some Hungarian paprika (and yes, you should definitely get some) to take back home. The second floor (or first floor for Europeans) is home to souvenirs, and, more importantly, the prepared foods section. Be sure to try a Hungarian langos! They serve them just about any way imaginable these days, but for your first taste, go traditional: fried bread, sour cream, and cheese. Sounds a little strange (at least it did to us), but it is amazing. Make your way across Liberty Bridge. After filling up at Central Market Hall, take a quick walk across the Liberty Bridge: the views are pretty and the walk likely necessary after binging on langos, but the real purpose of this walk is to make to to the other side of the Danube, where the rest of the day awaits. Almost directly across the street from the Liberty Bridge sits Cave Church, which is literally exactly what it sounds like: a church in a cave. Set literally inside Gellert Hill, the church is (clearly) remarkable in appearance and makes for a very interesting stop in any Budapest itinerary. There’s also plenty of history here, including surrounding WW2 and the Communist Era in Hungary. Relax the afternoon away at the Gellert Baths. Luxurious thermal baths in a building that makes you feel like Jay Gatsby and Daisy Buchanan are about to wander through the door at any moment–what could be better than that? We love the architecture inside the Gellert Baths, and can easily spend hours there–and that’s without even splurging on a massage, which we’ve promised each other we will do next time! The baths also have an outdoor section that is more like a community poos than anything, but we preferred to stick to the indoors. If you’d rather make the Szechenyi Baths part of your 3 days in Budapest (those would be the ones with the yellow building in the background that you see all the time on Instagram), they are all the way across town on the Pest side of the river. For that reason, if you’re headed there, you may want to consider shuffling this Budapest itinerary around and starting your morning there before going to Central Market Hall. Enjoy sunset at the Citadel. Remember how I mentioned that the view from Fisherman’s Bastion wasn’t our favorite view in Budapest? Well, this one is–especially at sunset. The Citadel is set at the top of Gellert Hill, and watching the sun go down over the Danube from that vantage point is a remarkable experience. 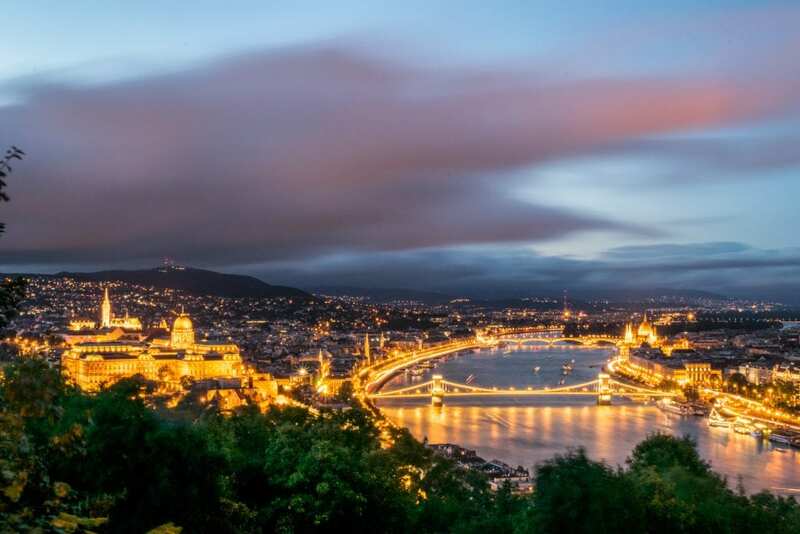 Be sure to stick around long enough to watch the lights come on over the city–there’s nothing like seeing Parliament, Buda Castle, the bridges and more lit up and glowing in the night sky. Spend the morning adventuring through Budapest’s cave system. It may not be the most traditional sightseeing activity, but climbing and crawling our way through some of the caves under Budapest is, hands down, one of our favorite things we have done in the city. Adventurous travelers will love, love, love the opportunity to explore these caves–we seriously can’t recommend the experience enough, and even with only 3 days in Budapest, it deserves to be on the itinerary. If you are interested in experiencing the caves but don’t think that an intense adventure tour is for you, there are walking tours available in more accessible parts of the cave system as well. Head to the Szabo Ervin Library. I’ll be honest: this library is a tiny bit out of the way from the rest of the stops lined up for the afternoon, but if you’re a book lover, it is so worth it. Nestled on the fourth floor of the Szabo Ervin Library sit several absolutely beautiful rooms that had me just about squealing. 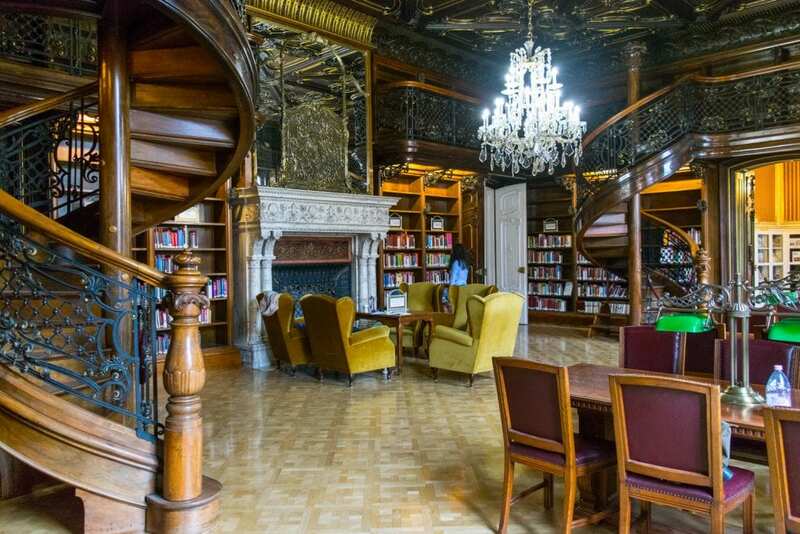 If you grew up dreaming of having thousands of books or of replicating Belle’s Beauty and the Beast library for yourself, well… it’s in Budapest, and the ticket to get in is just a handful of forint. Tour the Hungarian State Opera House. Majestic and beautiful, the Hungarian State Opera House is well worth a visit. Guided tours run 3 times per day in the afternoons, or you can check for shows running during your visit if you’d like to spend an evening at the opera! One of the two tallest buildings in Budapest (it’s tied with the Parliament building), St. Stephen’s Basilica is remarkably beautiful and ornate, both inside and out. If you’d like to add a gorgeous view to your list of things to see in and around St. Stephen’s Basilica, be sure to climb the tower! Take a ride on the Budapest Eye. Had enough incredible views of Budapest yet (seriously, it’s an amazing city to look at)? Hopefully not, because just a short walk away from St. Stephen’s Basilica sits the Budapest Eye. Far less famous than the London Eye (though with what I imagine are much shorter lines), the Budapest Eye is a great way to get a bird’s eye view of the city–I have a deep-seated and highly irrational fear of Ferris Wheels, but even with that, I can confidently say that riding the Budapest Eye was worth it. Stop by a ruin pub. The ruin pubs are one of Budapest’s unique features and are a must-stop on any 3 days in Budapest itinerary. The pubs are set up in what used to be abandoned buildings in Budapest’s old Jewish Quarter (technically called District VII). 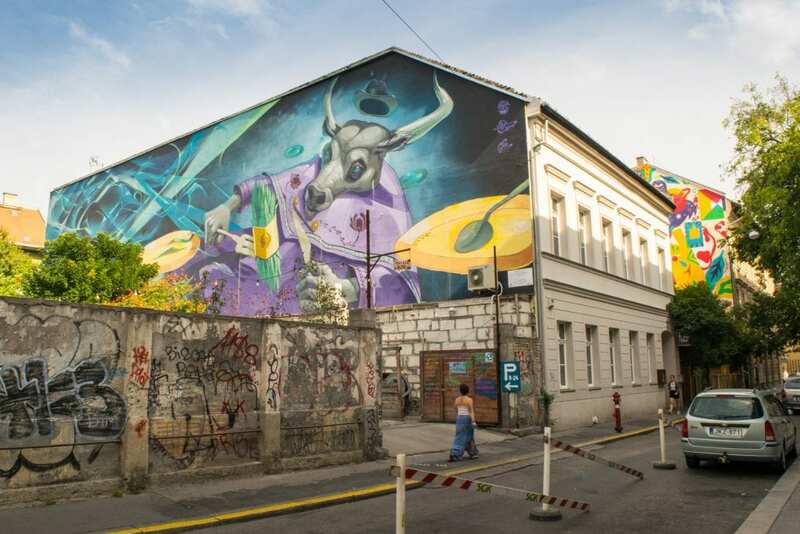 The ruined buildings, mismatched furniture, funky art, and, of course, the bars themselves all make the atmosphere wonderful and a spot you can’t afford to miss in Budapest. 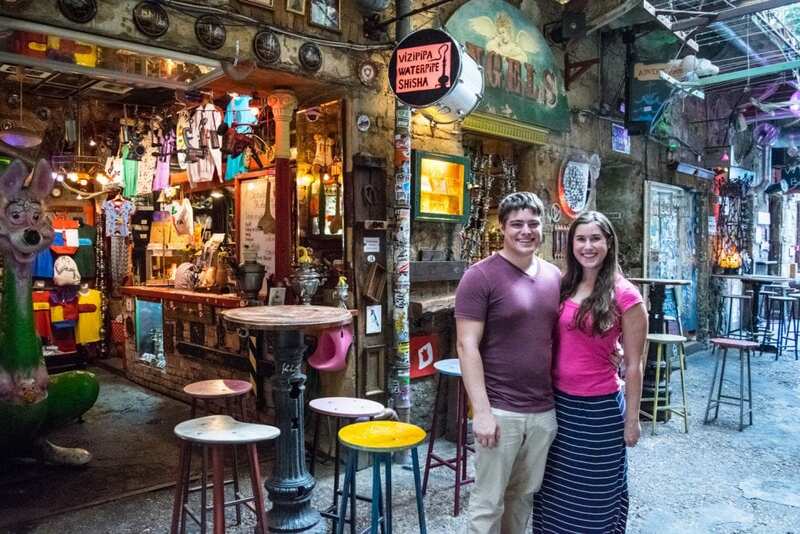 The oldest and largest of these ruin pubs is Szimpla Kert, which makes a great first stop on any ruin pub crawl. If you’d like to make your way through several ruin pubs and prefer a group experience, there are more than enough pub crawls to choose from! Book yourself a night on the town with a ruin pub crawl in Budapest! Budapest has a great public transportation network comprised of trams, a metro, and buses. You can buy single tickets, a group of 10 tickets, a 24-hour pass, a 72-hour pass, or a 7-day pass to the transportation system. Personally, we always bought the passes. It worked out to be cheaper and was also more convenient–we didn’t want to worry about forgetting to validate a ticket and end up with a hefty fine (and they do watch tickets very carefully in Budapest–we had ours checked several times). As many days as you have in Budapest, that’s how many you can spend in the city: in our minds, Budapest is perfect for longer stays–there is enough to do that you can’t get bored, and so many things that are wonderful about the city (looking at you, thermal baths) can be enjoyed over and over again. 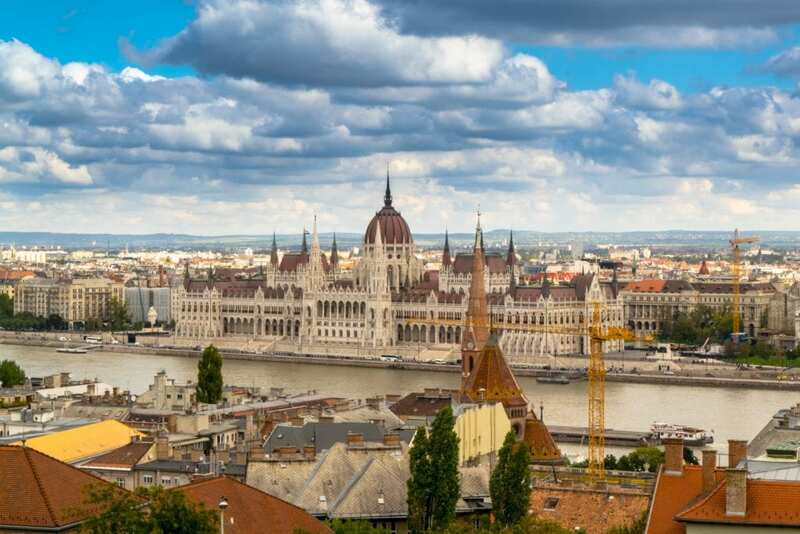 However, if you’re trying to work Budapest into a greater European itinerary, 3 days in Budapest is the perfect amount of time for a first overview of the city: you’ll see the bulk of the major sights and attractions, get a taste of the nightlife, and have enough time to fall just enough in love with the city that you leave planning your next trip back. 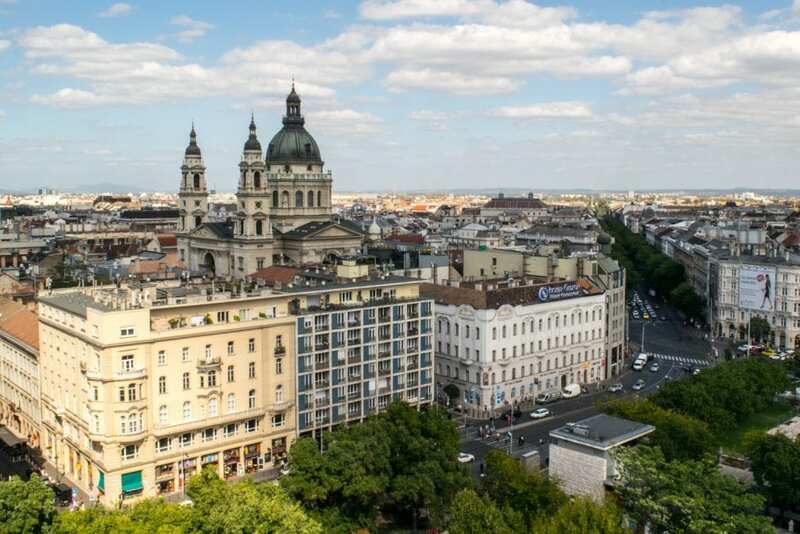 Though Budapest is generally vey safe, be sure not to visit without travel insurance! If you have more than 3 days in Budapest, consider adding on a food and wine tour to learn more about Hungarian cuisine (Hungary produces some very tasty wines! ), taking a trip out to Margaret Island to enjoy a bit of green space, visiting the Hospital in the Rock, dropping by the Pinball Museum (high on our list for our next visit), spending a little time at Heroes Square, taking a day trip to a nearby village… the options simply go on, and on, and on. As I mentioned–it’s impossible to be bored in Budapest. Jackquaters — Located right next to Vaci Utca and only 100 meters from the Danube, Jackquaters is the perfect location for anyone visiting Budapest. Budapest highlights like the Chain Bridge and Great Market Hall are within easy walking distance. Check rates & book your stay at Jackquaters! Feodorm Apartments — Perfect for the budget conscious traveler who wants to be close to the action, Feodorm is located a short walk from the Hungarian Parliament Building. Check rates & book your stay at the Feodorm Apartments! Want to try Airbnb instead? Sign up with our link to receive a discount on your first stay! Many thanks to Caving Under Budapest for hosting us during our caving adventure in Budapest! All opinions are, as always, our own. The ruin pubs sound awesome, I remember having a sneaky drink on a Soviet bar in Buda when I was about 15 and had escaped from my parents with some young locals! Always good to find a mix of cultural a d fun and it seems Budapest has exactly what you need to make that possible. Next time I head to Budapest I’ll be sure to use your itinerary for odeas. Haha, what a cool memory from Budapest! I’m sure you had a great time! It seems as wherever you goin Budapest you have an amazing view of the city! Look at that first photo of the Hungarian parliament! What a building! The Matthias church is beautiful aswell. A romantic sunset moment at the Citadel doesnt look bad either, one must come back with a beautiful sunset of the city right!? Budapest has been on my wish list for some time now but to be honest I am not sure whenever I will get the chance to explore the city. But that day I do, I would surely be happy that I have stumble upon your post! 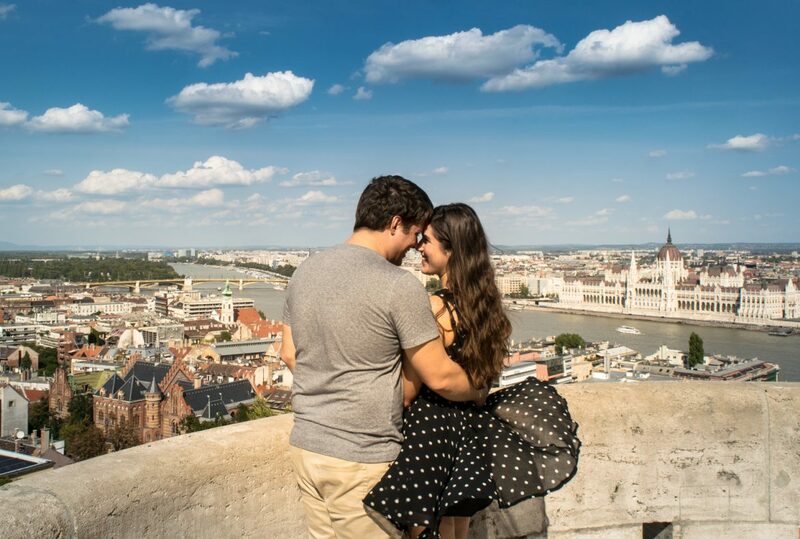 It often feels that way–there are sooooo many amazing viewpoints in Budapest! It definitely does have a magic pull–I’m sure visit #3 isn’t too many years away for us! Oh, the shoe thing just gets me. We just visited the Holocaust Museum in Washington, DC and the bin full of shoes made me cry. Budapest is a beautiful city and your photos are gorgeous. I didn’t realize Budapest had an Eye. That’s something that the hubby and I would have to do just to see the view. Thanks so sharing your itinerary. Oh, I know. 🙁 The first time we visited Budapest was just days after seeing Auschwitz-Birkenau, and it was even worse seeing them with those memories so fresh as compared to this most recent time. Such a sad spot. Apart from the (obvious) Parliament, I also like the architecture of Fisherman’s Bastion, your pictures are amazing! I had a friend who visited Budapest and wasn’t really impressed and since then, I’ve been a little unsure about placing it in my list of countries I’d like to see but I do like your suggestions and it seems like the sort of place I’d love to explore as a solo traveller. I might just fly there for a long weekend, thanks for sharing this 3-day itinerary, it’ll be super useful for me if I do that. I agree, Budapest would make a great long weekend! I love Fisherman’s Bastion, too–we’re not really winter people, but if I could be guaranteed to see snow falling on Fisherman’s Bastion, I’d probably make the trip during the cold! Wow, Budapest looks so gorgeous through your pictures. I have never been and it is definitely on my list for my next European adventure. I am someone who went and cried at Anne Frank’s house in Amsterdam. So I definitely would be crying if I saw the bronze shoes by the river too. Thank you for sharing your itinerary. Thank you! I agree–especially back in the 9-5 days, one of the hardest parts of travel was deciding how many days to spend where! This is a great itinerary and includes tons of things I did not do when I was there. I am now thinking I need to return too. The story about the shoes is especially poignant and tragic! There’s always a reason to return, right? That’s one of my favorite things about Budapest–even “big” items like the thermal baths can easily be enjoyed again and again. You gave a very detailed overview of Budapest. My favorite, the library. I LOVE libraries, and love visiting them as I go around, so seing that photo was super captivating for me. And the photo of the Citadella was enough for me to follow you on Instagram. So intrigued by your travels ? Aw, that’s awesome Karen! Glad to have you on Instagram. 🙂 I agree, we adore libraries (and bookstores, and books in general) as well–it’s actually a subject I’m hoping to blog more about in 2018! I was in Budapest three months back and I fell madly in love with the city, it is so beautiful and rightly called the “Paris of the East”. I loved the Buda Castle and Fisherman’s Bastion. 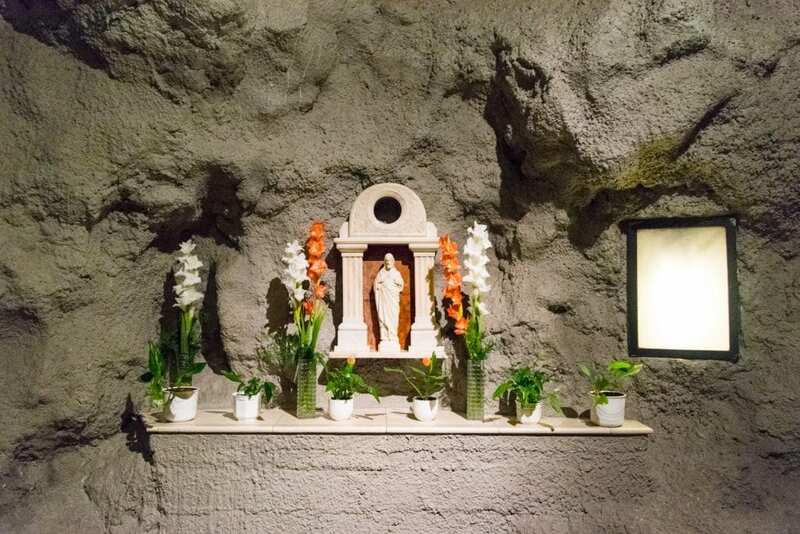 Unfortunately, I couldn’t visit the Cave church. Hopefully I’ll be able to do it this year. Superb guide to Budapest, Even though it was cold and windy in Budapest, the Budapest Eye was enclosed and gave protection from the wind. It was a great view from the top of Budapest. A great place to get some sceneic photos over the city and the rooftops. Or even a great place to sit and watch the wheel go around. Sunset at the Citadel definitely looks like a highlight. Would have to witness it one day! Budapest looks so stunning! Would love to visit one day! However, I’d suggest visiting some beautiful places in the countryside too, we have a lot to see there as well. Not sure what you mean by catching the train–you mean you’ll be taking a train ride to Prague to head back to India?–but I’m afraid I can’t offer much guidance on Berlin, as we’ve never been there. 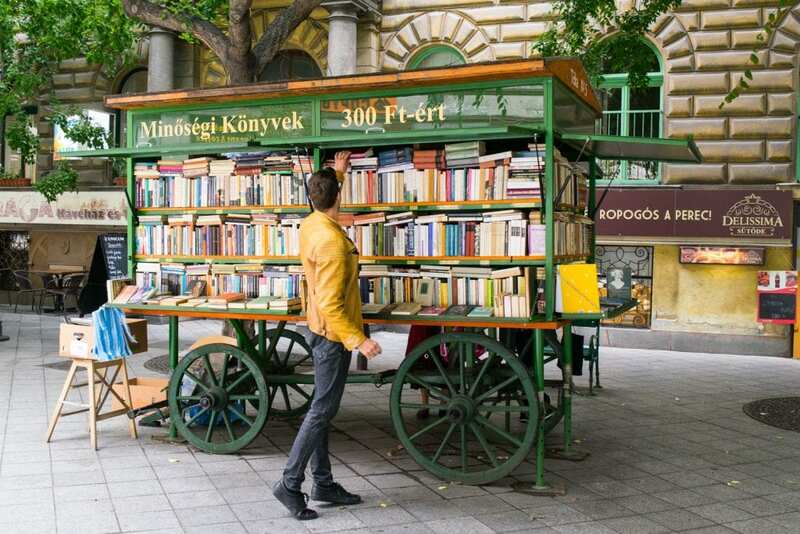 As far as options near Budapest for your second city, Vienna and Prague are both very popular and easy to access, and not as far from Budapest as Berlin. THIS ITINERARY IS FABULOUS! IT WAS REALLY HELPFUL FOR ME AND FAMILY TO GET AROUND BUDAPEST. JUST HAD A QUICK QUESTION, WOULD IT BE IDEAL TO DO PRAGUE WITHIN THESE THREE DAYS? HOPE TO HEAR FROM YOU SOON. Glad we could help, Desiree! If you’re asking if you could do Prague as one of your three days in Budapest (so two in Budapest and one day trip to Prague), I wouldn’t recommend it–it’s further than it looks, and Budapest has a lot to see! Better to save Prague for a different trip, or visit before or after seeing Budapest. Thank for all the time you spend in putting this three day itinerary together. We are head there in August/September before the start of a river cruise to Linz. Any suggestions on a private tour of some of the sites using Viatour? We actually use Get Your Guide instead of Viator, but they offer similar services. I’ve linked some options in the post, but they are generally group tours. If you’re looking for a private experience, you’ll likely find options with similar itineraries available on both sites!